The allocation report is not reporting the correct amount paid. How do I correct the amounts paid? If the report is not showing the correct amount paid, then typically, there is a correction needed on the report setup. There a few common reasons why the amount paid is incorrect: payments missing on the report, payments from a prior fiscal year appearing as a payment on the current year, payments appearing on the wrong line of the report or non-allocation payments appearing on the report. In the first case, there are expense account links that are missing and need to be added to the report. In the second case, accounts from the prior year are linked to the current year. To correct this, remove any links that have a year designation in front of the account name, ex. "16/17 General/World Evangelism Fund." Accounts for the current year do not have a year at the beginning of the account name. In the third case, an account has been linked to the wrong line of the report. The existing link needs to be removed and a new link will need to be added to the correct line. In the last case, some accounts that shouldn't be linked to the report have been linked. These accounts will need to be removed from the report. From the Checkbook screen, click on Setup and then Allocations. On the left side, click on the allocation that is not showing the correct amounts paid. 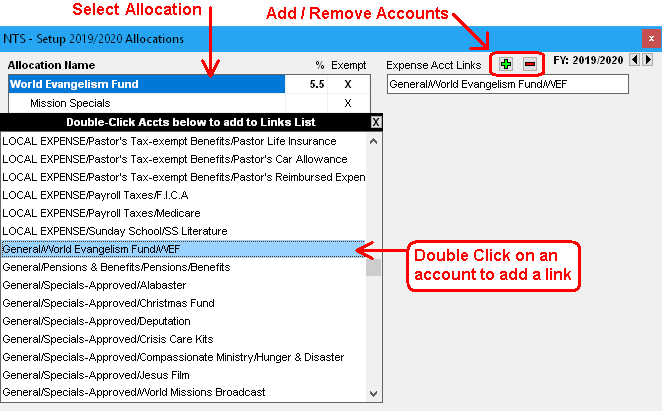 On the left side, the Expense Acct Links list will show all the accounts currently linked to the allocation. All payments made to the accounts listed will be included in the amount paid. To remove an account that should not be linked, click on the account and then click the button at the top of the link list. To add an account, click on the button above the Expense Account Link list. A list of all your expense accounts will appear on the right side of the screen. Find the expense account you need to add in the list. Double click on the account to add it to the link list. If you need to add more than one account, double click on each account you need to add. Click the at the top left corner of the expense account list, to close the expense account list. Repeat steps 2 through 5 for any allocation that is not reporting the correct amount paid. Can't find what you are looking for? Click here to submit your question, contact us at help@ntssoftware.com or call us at (817) 318-0303.